We were greeted by a group of children and teenagers kayaking in the bay. Soon after John, the camp leader, joined us and started to explain: This used to be a native village of around a thousand and many of the helpers had relatives that once had lived here. It was one of the largest native villages in the PWS. Nowadays nobody lives there apart from the caretaker. 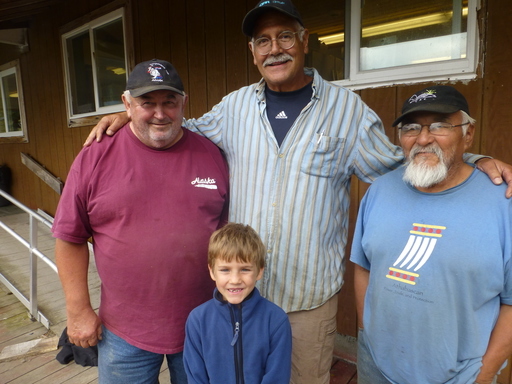 Yet for 20 years every summer the village is revived for a few weeks, as the base for a camp where individuals from all different native villages in Alaska to come together and learn about their ancestor's culture and lifestyle. 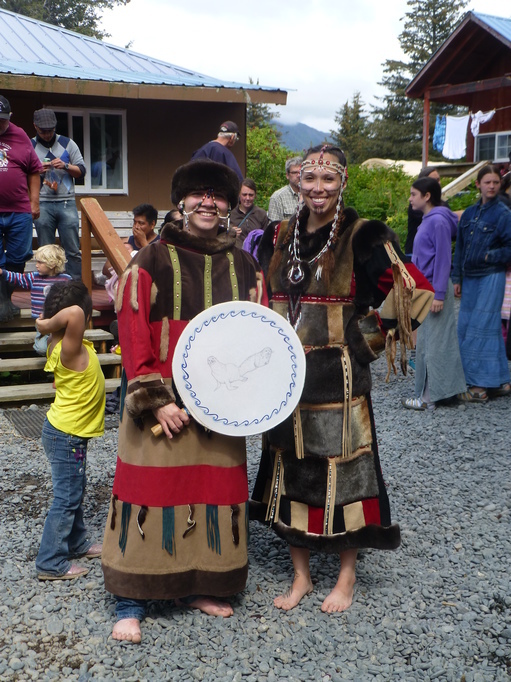 They learn about subsistence, to paddle the traditional boats: the unyak and baidarkas, how to make wooden hunting paddles and traditional mittens, learn songs and dances and much more. We were lucky enough to come here during this time and get a small taste of these traditions. It is needless to say we learnt a lot. 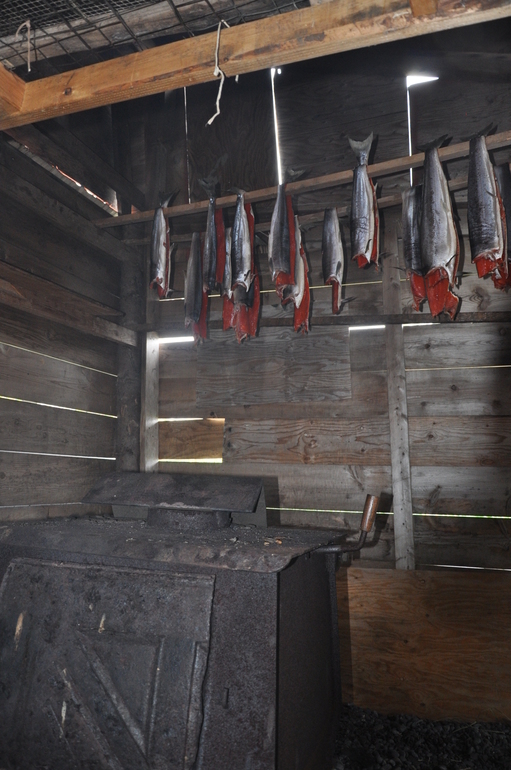 From the salmon smoking hut, to watching halibut and seal being gutted. We even got to try seal which is weird mix of fish and meat. With the texture of meat and the taste of fish we couldn't quite get our head around the taste. The meat is very dark as it is rich in iron and is said to be very healthy. The paddles for the baidarkas, the traditional kayaks, are pointed at the end to make sure they are nearly silent in order for hunters to easily sneak up on prey. 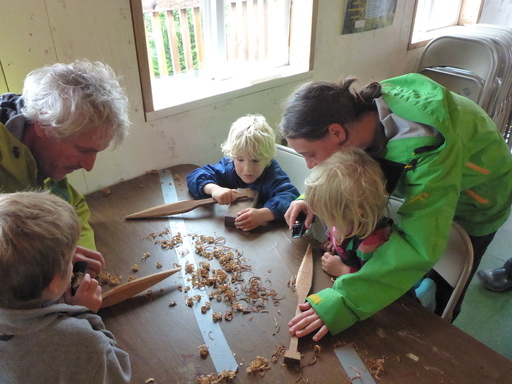 We all had the chance to make one: the children made model ones and the adults actually got to make to real sized ones for our dinghy. We had a great time making them and they turned out beautiful. So now Salina and Andri have a set of paddles to help row ashore. The wood used is usually red or yellow cedar and smells great. 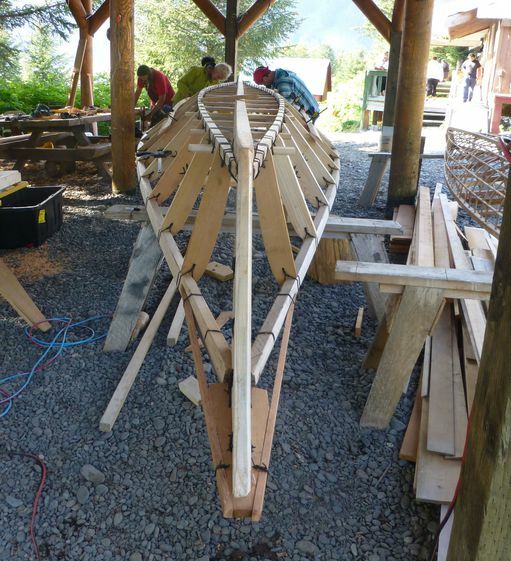 Dario thoroughly enjoyed helping build part of an unyak, a large flat-bottomed canoe. One evening Dario did a presentation for the whole camp and exchange the camp participants showed us some winter games. The hunters would play these to stay fit, warm and keep spirits high. Then we tried to sail to Icy Bay but after 24 rocky hours of headwind again, we had barely moved. So we turned back towards Hinchinbrook and, with the wind with us for once, were back in half the time. After a good night's sleep in Garden Cove we left again for Icy Bay. On the way, just after watch handover Sabine called that there were porpoises. 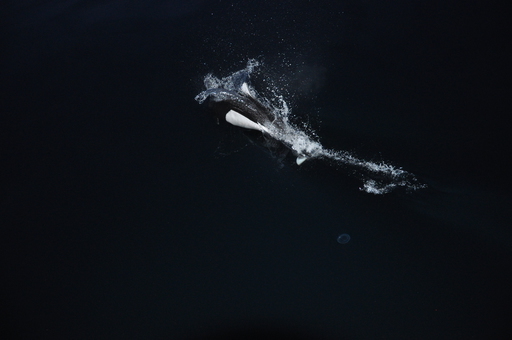 The two Dall's porpoises stayed with us for an hour playing in the bow wave. What a start to the day! In Icy Bay we were warmly welcomed by the hosts of the Icy Bay Lodge, TJ and Wayne, and were spoiled with amazing food and a shower. On the way into the bay we had seen a beach covered in washed up trees. This looked like a spot where we'd find a lot of tsunami debris. So the next morning we set of to have a look. On the way a large brown bear looking for food slowed down our party considerably. Surprisingly we did not find a lot of debris on the beach itself. 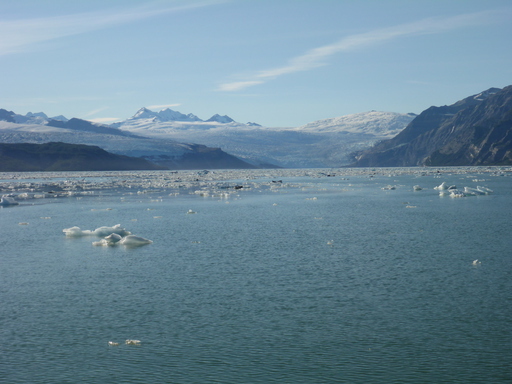 Before sailing on to Yakutat we went further into the fjord to have a look at the glaciers and get closer to Mount St. Elias. 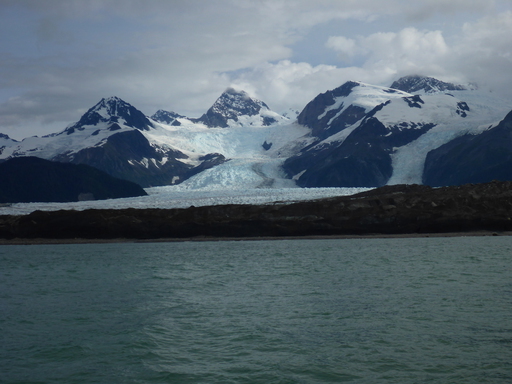 It was stunning: slowly floating along under a cloudless sky with icebergs, glaciers and mountains surrounding us. A few harbour seals even slid off their iceberg to come have a closer look at the boat. 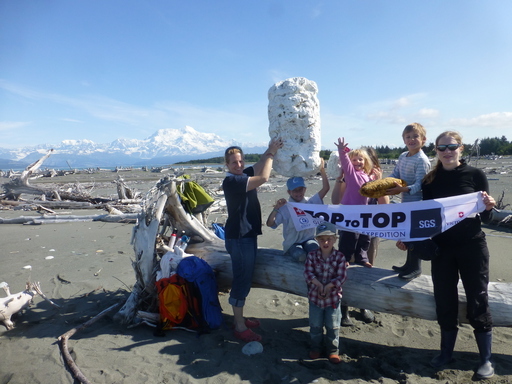 We arrived in Yakutat, where we met with Quentin Hurt, whom TOPtoTOP had met at the Durban, South Africa, at the COP17 Climate Change Conference in 2012. The weather was improving but we still had mostly easterly headwinds. 1st August is the Swiss National Day, the founding day of the country. It's customary to build a bonfire. So before we could leave, we travelled out to a camp site on the Situk River, built a fire, roasted some sausages and waited for the tide to turn. Then we went on to Lituya Bay. The entrance is dangerous and so you have to wait for the tides to turn before you can attempt to enter. In 1958, ice and rock dislodged from the nearby mountains, causing spray over 600ft and a tidal wave that rose 100ft high, destroying two boats and carrying a third miraculously out of the mouth, unharmed. Today there is still evidence of the natural disaster, but for us it was simply a quiet bay where icy rivers run over the lichen-covered rocks into the murky turquoise glacier water. We were fortunate to clearly see the two arms of the La Perouse glaciers descending to within a hundred meters of the coast. The high rainfall in the area keeps it active but the warm air had caused it to recede already this year. Elfin Cove was, as the name suggests, a stilted village tucked into a wooded bay. We couldn't stay for long but while we toured the houses and viewed the old school room, now museum, three float planes arrived and left, carrying fishermen in and out. There are no roads and hence no road vehicles. Instead all the houses around the bay are connected by boardwalk. Dario made contact with old Schwörer friends, Bill and Marjory, who they'd met in Mauritius and travelled with through South Africa on to St Helena. 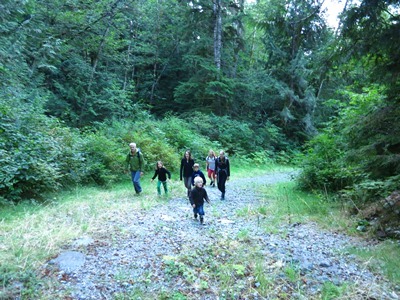 Marjory kindly drove us all through to the Tongass National Forest, where hiked up to the Mendenhall Glacier face. Andri and Dario practiced climbing on the crevasses while the rest of us climbed (as best we could in our hiking shoes). 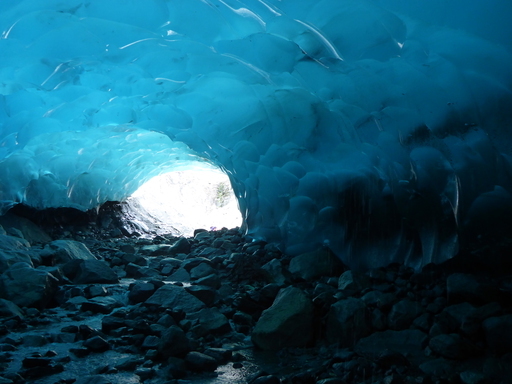 We visited the spectacular ice cave (a portion of which collapsed just a week ago). 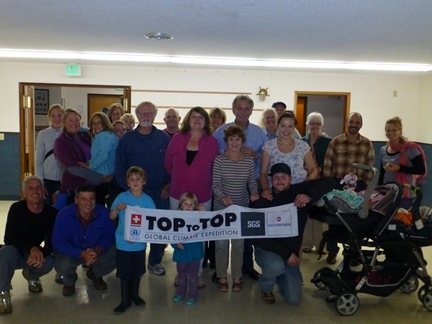 On return in the evening, we met Bill, Marjory and friends for a barbecue at the Skaters Cabin, near the trail head. 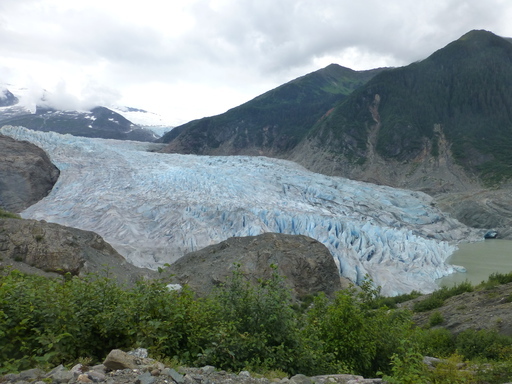 The view of the Mendenhall Lake and Glacier face were spectacular but Marjory explained to us that when she arrived in Juneau, the glacier face was beyond the waterfall and that the face is receding at about 160ft per year (about 6 inches per day)! Currently, we are moored outside Bill and Marjory's house. 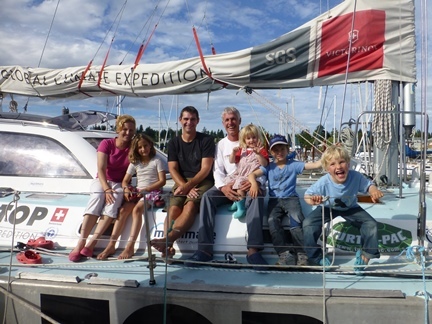 Dario needed to complete some customs formalities and we broke the voyage for the Schwörers to regroup, celebrate Noe's birthday and plan the final stages before the winter of 2014. Have you ever thought how the wind might influence glaciers? 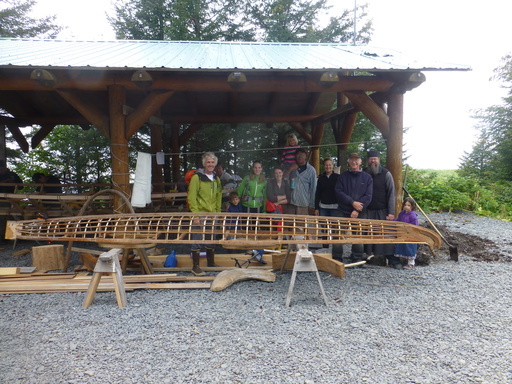 In Juneau we had the pleasure of meeting mountain guide and environmental researcher, Jamie Pierce. 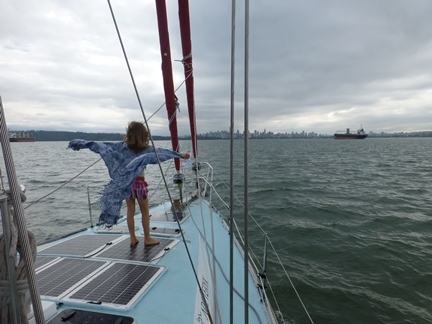 He saw Pachamama sailing past his house and e-mailed Dario to introduce himself. He has studied weather, snow and ice in the US, Antarctica and Europe, as it pertains to snow and avalanche research, guiding and education. Jamie's interest in this field, like Dario's, was spurred by his concern at how quickly the glaciers he knew were retreating. He invited us to participate in a data retrieval and maintenance mission near Juneau. With a difference: we would be helicoptering in to his station at Camp 17 above Juneau. We met at the Era Helicopters helibase. Era aids in support of his research project by offering Jamie transport in between a very busy tourist schedule. After a safety briefing, we were on board with pilot Jiri Hanis climbing the 4500 ft in five minutes to a Juneau Icefield Research Program Camp 17 between the Cairn and Vesper Peaks on the Lemon Creek Glacier. This is the site of one of a long-term Mass Balance Glacier study. In the 61 years of study, the ice thickness has decreased 30 m (about 90 ft.) - similar to other glaciers studied in the US. Jamie is interested in how the snow and ice grains form and the potential for avalanches. 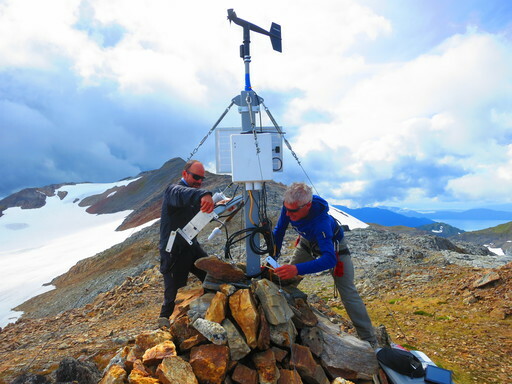 He measures how the wind force influences the buried snow thus affecting shape and density of snow grains and the potential for weakening at or near buried layer interfaces. This in turn might create conditions for avalanches- so critical in Juneau particularly because the capital of the State of Alaska lies at the foot of the valley below. He was also interested in retrieving dataloggers that were measuring the pressure pulses at the base of Lake Linda. The lake, which ultimately drains through supraglacial channels into Lemon Creek at the base of the glacier. The old monitoring equipment was presumed lost under the ice but Jamie suspected that enough snow might have melted this season to expose the old station and allow retrieval of the critical data. Measuring wind in these conditions is not easy. He has already lost sensors to the ice and... to high winds. His last sensor was rated at 150 mph...and broke. His new ones are rated to 200 mph and contain special materials to limit the impact of ice. All his information is stored at the station and simultaneously transmitted via satellite to his base. All power is provided by a solar panel. 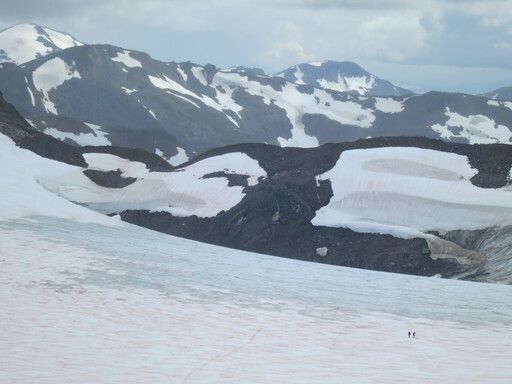 We helped Jamie rearrange his equipment and then Dario and him headed off across the glacier towards the remains of Lake Linda to see whether they could find the old weather station. An hour later they returned triumphant: they'd managed to collect two data loggers, one still collecting data. As they climbed the hill, Jiri returned to collect us. Perfect timing. And none too soon for Jamie who was anxious to access this data to see what secrets it might hold. For him, it was better than treasure; a view of the world beneath the ice that influences so much of what happens above and beyond it. Jamie and Dario cut lonely figures on their hike across the Lemon Creek Glacier towards the now-drained Lake Linda. Back at base we discussed glacier formations and how these might be changing. We talked about the particularly worrying phenomenon of Jökulhlaup- an Icelandic name for a glacial dam burst. With warmer temperatures, the rate of water accumulation within sub-surface dams in the glacier is increasing. When there's too much water, this dam can erupt, causing a rapid release of water. 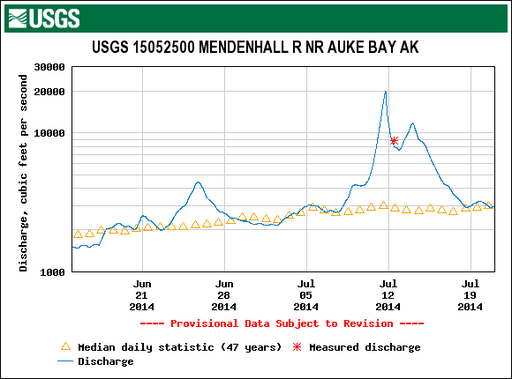 On the Mendenhall Glacier above Juneau, for instance, the normal water discharge into Mendenhall River averages 2'400 cubic feet per second (cfs). During a Jökulhlaup, this rate can increase nearly ten times to 20'000 cfps, a tidal wave of sorts for those below. This type event is happening annually since 2011, far too regularly for the likes of Jamie and Dario. We hope that the unusual Top-to-Top mission to the Lemon Creek Glacier helps a little in improving our understanding of these events. Our thanks go to Jamie Pierce of the University of Alaska South East and Era Helicopters for making this mission possible and for our opportunity to learn more about these fascinating phenomena. On the 6th of August we arrived in the capital of Alaska. We stayed with Bill and Marjorie in their beautiful house. Their hospitality was outstanding and we had time to recover and plan our next steps. Our friends Fred and Cinda joined us rock-climbing and fishing. 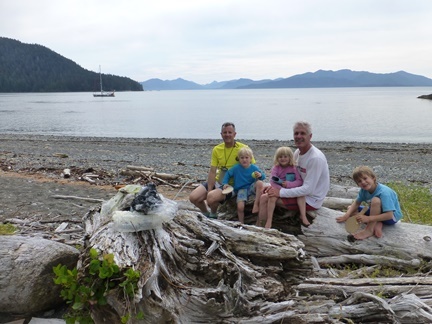 The kids were excited to catch huge salmons at the creek close to Bill and Marjorie's home. We had also the opportunity to make friends with Jamie and Adrienne's family. 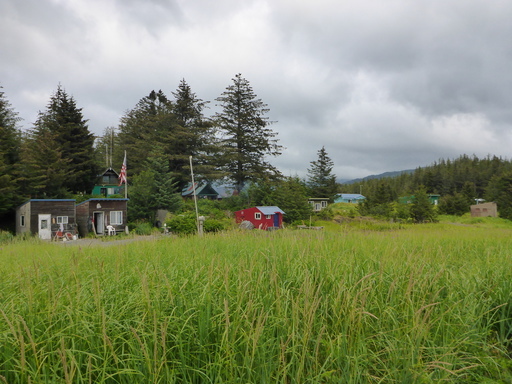 On the 14th of August, after repacking, we were sent off by the Schwoerer's very kind host, Marjorie and Bill, with a bag of bagels from the Silverbow Bakery (the oldest in Juneau). Having passed one massive cruise ship that seemed to take up the whole channel we turned the last corner and saw the South Sawyer Glacier face. The water was covered with icebergs of all size and we had to move slowly and carefully to make our way forward, as if in a moving maze. Every so often, we'd hear the solid clunk of ice hitting the aluminium shell and worried glances were exchanged. If the ice is sharp, it can cut the hull like a can opener. Pictures don't reflect the size of the glacier. We must have been over 300m away because by the time we heared the irregular thunder of a sheet of ice shearing off into the water, the ice had already hit the water. The power and size of these moving jagged carpets is daunting. We watched from a distance, nervous of the moving icebergs and the risk of a wave caused by the falling ice- it would make us as vulnerable as an ant in a shaken glass of iced-water. We turned with the tide to go back down the arm. With that the weather closed in and the rain and fog returned. We'd been just in time to witness the Arm and the Glacier in reasonable sunshine. We returned to our anchorage of the previous evening and took the opportunity of a short break in the weather to take a walk on the nearby rocky beach before returning to the boat to have a birthday dinner of spaghetti for Noe. On our way through the Inside Passage we spotted whales several times. 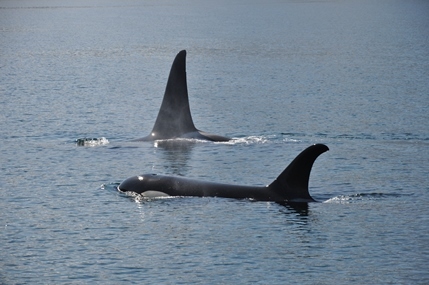 Once, a mother and its calf swam with us for about half an hour. The calf's playfulness was the cause of much amusement. That afternoon, we weighed anchor and set sail again for the inside passage. By nightfall we had made the northern tip of Vancouver Island and sailed between the busy channel between Hope Island and the main island. Thousands of gulls circled around the boat in the dark, calling eerily in the gloom. As day broke, we turned south east and headed for Cormorant Island, where we'd heard of an excellent museum on First Nations history. The next morning, the children put on an impromptu recorder concert for Dario&Sabine's wedding day, championed by Salina and Andri joined by Noe with his own new birthday reorder. We then took advantage of the northernly winds for some good saling. As evening approached we sailed for Attwood Bay. We passed through three sets of rapids which bucked and twisted Pachamana as all the crew kept watch for rocks and eddies. We were relieved to make it through unscathed. 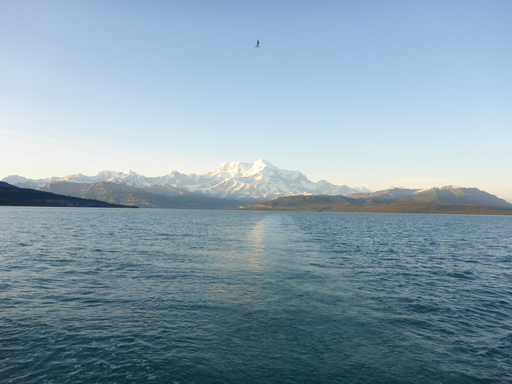 We passed through an imposing channel which looked like a mountain had been sliced in two to make a pass for us and into the still of Attwood Bay, a pretty anchorage beneath. The water was clear and warm (or warmer than we had been used to) and we dived in for the first evening swim since Alaska. The dawn of the 26th was warm and still and we took off walking up a logging road to retrace Dario's steps of 18 years earlier (1996). He wanted to show the family the place of an encounter he'd had with a Grizzly Bear. It had been one of the most frightening experiences of his life and he wanted to see the place in the light of day again. Unfortunately, although the walk and views were fine, we were not able to reach the place in time. It was good to stretch our legs again but the winds and tides called and we were back on board heading south towards Desolation Sound by 11:00. The mountains rose from the still morning waters, opening up as the day progressed. As evening settled we took shelter in a small cove... along with many mosquitoes. It was an uncomfortable night and we were happy to sail for Comox in the morning, rounding Hornby Island and heading north up the channel for the Comox Valley. We needed to drop Meret so that she could connect with a flight for Switzerland to start school again. Unfortunately the buses and ferries were not in our favour and we had to make for Vancouver at nightfall.